Decorating for the holidays is one of the great joys of the season. Creating your own holiday decorations can show off your style and add some uniqueness to your home. Get the whole family together to celebrate the season and make festive decorations with our holiday decorating tips. You can bring some uniqueness to your front door this holiday season by making your own wreath. Many craft stores have wreath frames made of wire or grapevine. Once you have your base, decorate it! You can use garland, tree ornaments, or even gift bows to layer with or create a pattern. Get creative, and layer your wreath with multiple materials. Combining gift bows and garland can be a fun way to add depth to your wreath. This decorating tip is easy to create, with the main material being available in your own backyard. Get the family together to search for fallen leaves that are still in good shape and have edges that haven’t broken off. Choose a spray paint color that goes well with the decor in your house. Silver or gold leaves can add shine to your space and go well with most other decor colors. Lay the leaves on cardboard or newspaper outside, and spray one side of the leaves. Once that side is dried, flip them over and spray the other side. When finished, you can place them across a fireplace mantle or use them as part of a centerpiece. Paper is a great material to use when making holiday decorations. You can make garland or snowflakes with paper. A simple garland can be made by cutting out leaves on color paper and attaching them to string or ribbon. Make paper snowflakes by using our snowflake template, and hang them with string to help turn your home into a winter wonderland. We recommend using Hammermill® Copy 20lb paper. Gift wrap isn’t just for wrapping presents. You can use gift wrap to decorate your door or create Christmas tree decorations. Wrap your door with your favorite gift wrapping paper and add a large bow to the middle of it to help add some holiday fun to your house. Cut out two circles from cardboard and two circles that are the same size from your favorite wrapping paper. You can use an empty cereal box to trace and cut your circles out. Attach a ribbon to the top middle of one side of the cardboard with glue to create a loop. Glue the cardboard circles together, and then attach one wrapping paper circle to each side. Once finished, your homemade ornaments are ready to hang on the tree. Show off your painting skills by painting a glass bulb ornament. You don’t have to create a complicated painting on your bulb. Experiment with bright colors and different patterns to create a fun design. Each family member can paint their own to hang on the tree, or hang multiple bulbs from a ribbon and string across an entryway for a unique way to show off your painted bulbs. These creative holiday decorating tips can help you get in the spirit of the season and have your home looking festive. 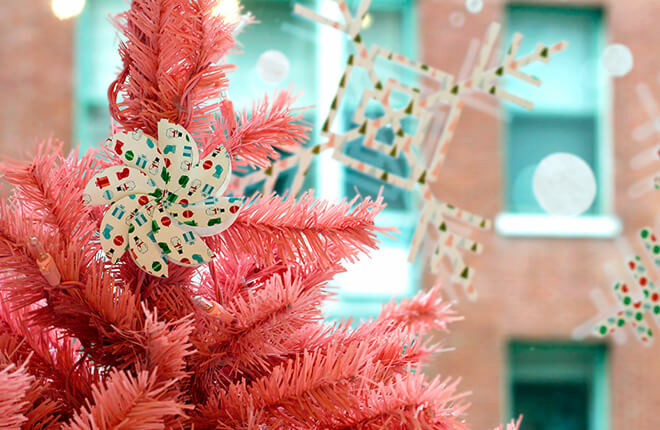 For more DIY holiday decorating ideas, check out our DIY Holiday Decorations. We hope you have a wonderful holiday season!